Here we will describe how to measure the IV curves for a specific MESFET amplifier, but you should be able to use this procedure for any MESFET or PHEMT transistor. if a crumb is wasted, God gets so irate! The other thing that they did to keep cost low is not to use any via holes, the amp is grounded using wirebonds ands it is eight mils thick. But we digress... The amplifier uses a single, 900 um MESFET (you can see three 300 um fingers if you look closely with a good microscope). The source connection is the pad on the lower right hand side; it is grounded because this is a common-source amplifier (most FET amps are common source). Note that the source is actually connected to a gold pad on the topside of the alumina circuit, this is grounded through four plated (but unfilled) via holes. The gate connection to the chip is also the RF input (left side), while the drain connection is also the RF output (right side). 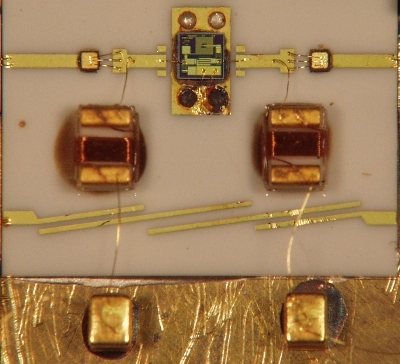 A pair of bias tees are realized off-chip, using series single-layer 100 pF capacitors to block DC from RF, and shunt structures consisting of wire-wound inductors that are connected to multilayer bypass capacitors (10,000 pF). 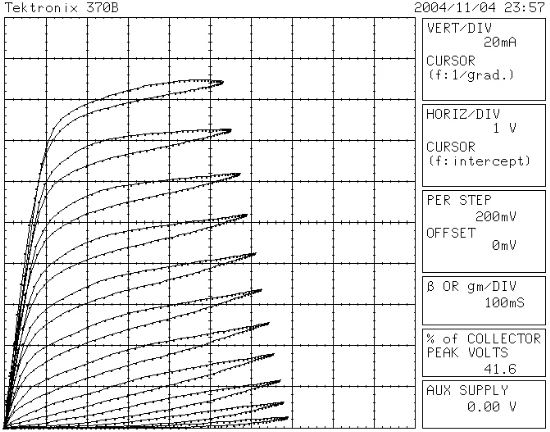 Not shown are the feedthroughs for injecting the bias voltages. Ignore the interdigitated filter below the wire-wound inductors, this is a cheesy test jig that was used for a variety of purposes by an insane individual. This is a MESFET amplifier, so it can handle pretty high operating voltages (5, 6, 7, maybe 8 volts). It is also an example of a depletion mode device. This means that the channel current is reduced by operating the gate, in this case, with a negative voltage to get to its normal operating point. The data sheet calls for 5 volts drain bias, at 90 mA DC current. It's up to you to figure out the proper gate voltage to get there! Cycle the 370B on/off to clear out whatever settings that last person used. Although the 370B defaults to nearly benign conditions, you should make a habit out of checking a few things we will describe here; if you have an older CT, you will need to manually set more of the control knobs. You should check to see that the polarity of the collector supply is positive (set to NPN on old curve tracers) and it is in swept mode as opposed to DC or AC modes. 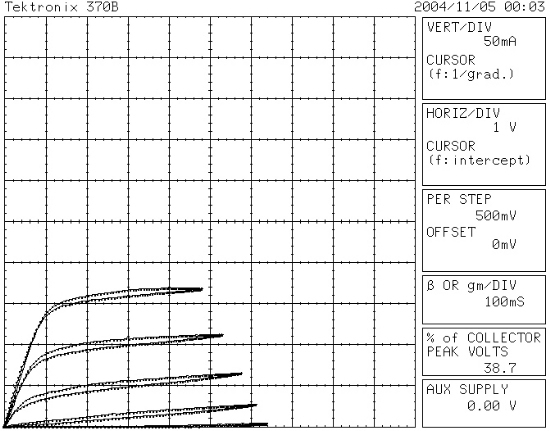 You should make sure that the step generator has zero offset voltage. Set step generator to "voltage" (not current! ), negative polarity, zero steps, 0.5 volts/step. Set peak power to 10 watts. Set maximum collector voltage to 16 volts. Note that all of these settings may not be appropriate for amplifiers other than the P35-4100, so you may have to think about what are the best settings to display your IV device's curves. Now you are ready to begin the measurement. From the above curves, you can say that IDSS for the device is 156 ma, measured at 2 volts. You also can say that the transconductance of the device is approximately 100 mS, because there are 2.5 vertical divisions between the voltage steps near the center of the curves. If you like, you can change the step size to 200 millivolts/step for more detail. We recommend that you decrease the collector (drain) voltage to zero before you change the step generator knob. 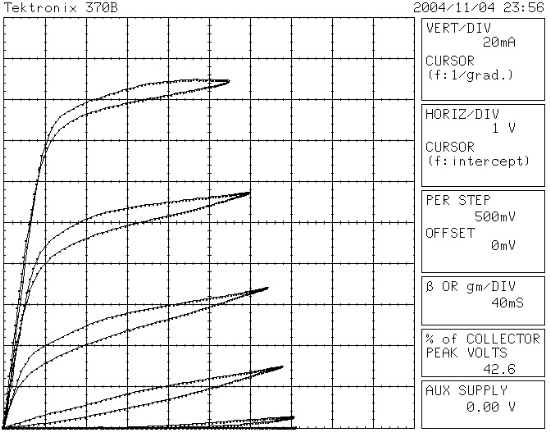 Then slowly increase the drain voltage and add more steps until you get the following curves (we've maxed out the step generator at ten steps). A nice set of curves indeed. The hysteresis in the curves is due to the capacitance in the bias tees, which is a necessary evil because it helps keep the device stable. 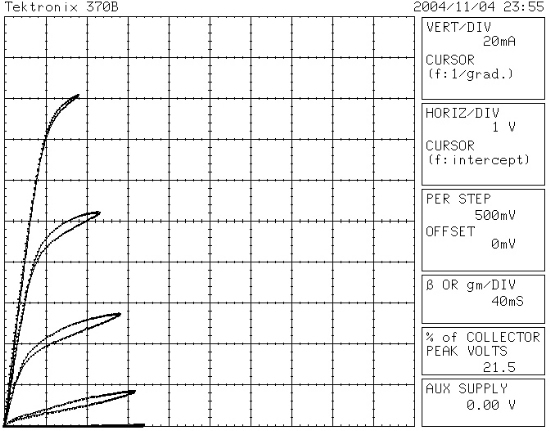 From this curve, we'd say that the pinch-off voltage VPO is -2 volts (looking at the bottom line, which is 10 steps x -0.2 volts). 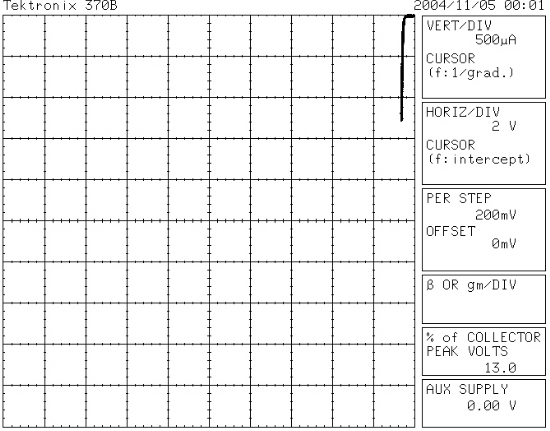 And now we can see that the proper gate voltage to get 90 mA at 5 volts is approximately -0.7 volts. This is extrapolated between the fourth and fifth curves from the top (-0.6 volts and -0.8 volts). Now it's time to measure gate-drain breakdown voltage. We have to turn some knobs again. What do you do first? Turn down the collector voltage to zero, and disable the output to your device. Again, we stress, this should become a habit. In this measurement, we want the source (emitter) terminal to be open circuit. You need to set the output to "emitter open", this shuts off the step generator as well (which is not needed for two-terminal measurements such as this). Now we have to explain a weird convention... the breakdown voltage between gate and drain is a negative voltage. The way the device is hooked up, you will be sending a positive voltage between the drain and the gate, which is the same thing. But because we want to report a negative voltage, most engineers invert the display to the upper right corner. 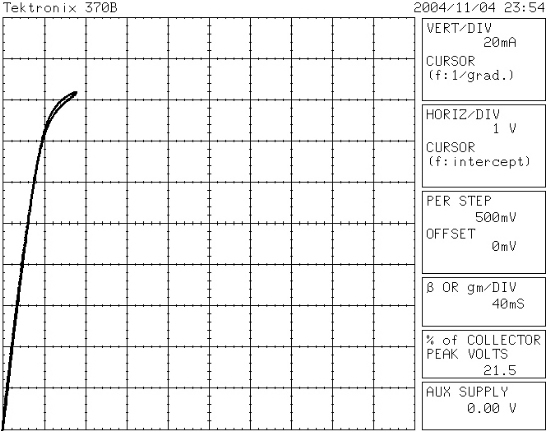 Now when you increase the collector voltage, the curve will sweep to the left and down. OK, enable the DUT and start increasing the collector voltage slowly... The DUT should act like an open circuit (horizontal line) for a few volts, then breakdown should occur. You don't want to have a lot of current this way (just a milliamp or two) or your device will be damaged. 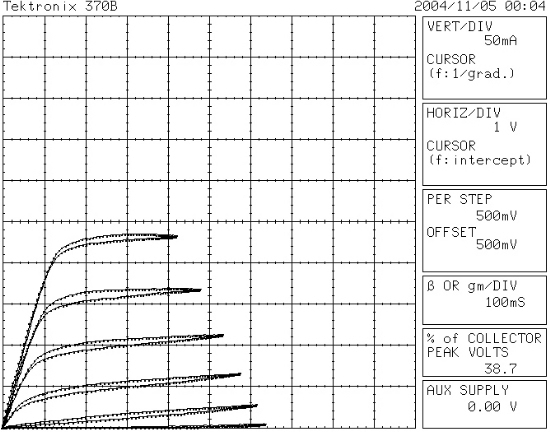 In the case of the curve below, we measure Vbr at 0.9 ma (1 ma/mm periphery) and we get -14.5 volts. Below is plotted the forward conduction of the gate drain junction. No need to measure this, we plotted it to show you what happens if you have the polarity wrong in as breakdown measurement. Conduction begins at about 0.5 volts for a Schottky junction on GaAs. It takes quite a few milliamps to blow up a device this way, but imagine what happens if you switch the polarity of your gate power supply to an amplifier and it is set at +1 volt instead of -1 volt. It will hit whatever current limit you have, and if that current limit is hundreds of milliamps, good bye amplifier! Now it's time to go for the gold medal of I-V curves: determining the true open-channel current of a FET. To do this, the top curve must be forward-biased to approximately 0.5 volts (remember, we don't want to run a lot of current into the gate, so let's not get carried away). What do you do first? Turn down the collector voltage to zero, and disable the output to your device. Now it's time to get fancy and use the offset feature of the step generator. Set the offset to "oppose" (we want to put a positive voltage on the negative step. Set the offset to 500 millivolts. 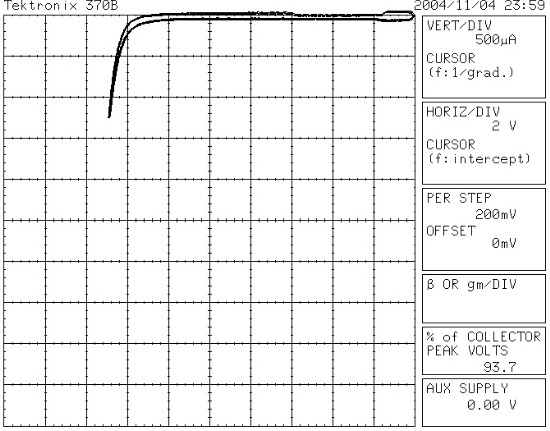 Now trace the curves and you will see the "hidden" current-carrying capacity of the amplifier. Imax is 225 ma, measured at 2 volts. There, that wasn't so hard. Repeat after us... the curve tracer is your friend!